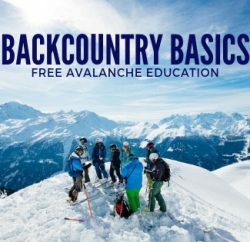 If you explore the backcountry on skis, board or sled, or if you’re considering it as a new pastime, you don’t want to miss this FREE, three-part Avalanche Education Series at Tahoe Mountain Sports. Three separate, fun and educational events will bring the Tahoe-Truckee backcountry community together for experiences like no other, valued at: priceless. The cost to the public: free. A popular and credible guest speaker will be on-site to inform and entertain each night of the Series; look forward to learning directly from professional skiers, mountain guides and avalanche safety instructors, and local non-profits that work to keep you safe in the backcountry. 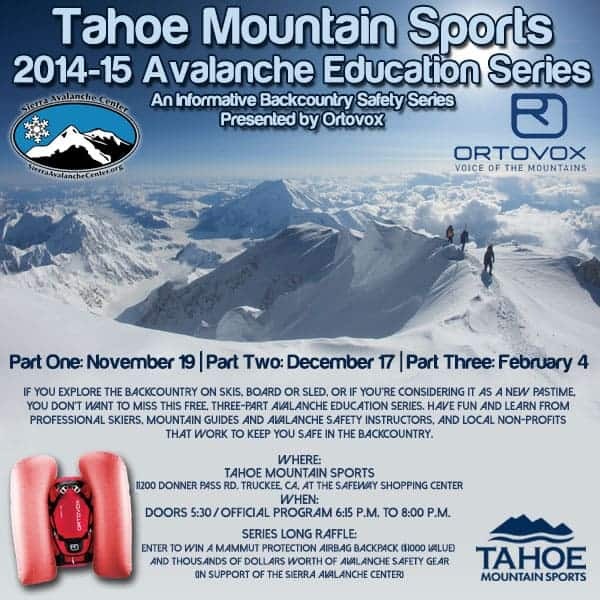 Join the knowledgeable staff at Tahoe Mountain sports for this three-part educational series. 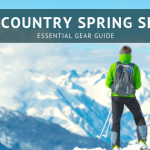 Each event is free, open to the public and will include a 45-60 minute classroom presentation/discussion with backcountry equipment representatives leading each entertaining and informative session. The Tahoe Mountain Sports 2014-15 Avalanche Education Series is not intended to be an exclusive, end-all education, but a rare opportunity to learn how to be well-versed on the information available to eventually become accomplished in the practices that can keep you safe while participating in backcountry snow sports. Discover the wealth of knowledge available through local classes in the Truckee-Tahoe area, learn how to use and service your gear and participate in hands-on activities to fortify your skills. Additionally, a series long raffle will take place in which a grand prize of a Mammut Protection Airbag and thousands of dollars worth of avalanche safety gear will be awarded to lucky ticket holders. 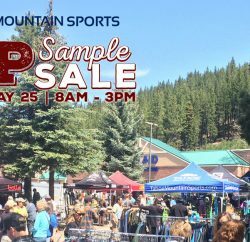 Tahoe Mountain Sports (TMS) will offer special deals on products in the store each night during the three part series! Raffle(s): Participants can enter TWO raffles this evening, both benefitting the Sierra Avalanche Center. The first raffle is a series-long raffle (to be drawn on Feb. 5, 2014) that includes a Mammut Protection Airbag Backpack AND thousands of dollars worth of avalanche safety gear. The second raffle will be for Ortovox avalanche rescue gear including beacons, probes, shovels and more, all of which will be drawn this evening. 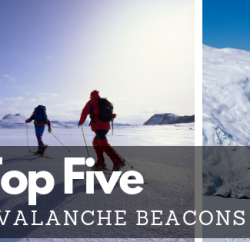 As the first of a three-part Avalanche Education Series, join your fellow Tahoe backcountry enthusiasts for a community-oriented fun night at Tahoe Mountain Sports on November 19 and learn the basics of beacon use, or just brush up on your avalanche expertise and transceiver techniques. 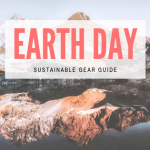 Experienced mountain guide and Level 3 AIARE instructor Tom Carter, and Ortovox Rep Jared Rodriguez, will be present to lead a discussion about the basics of companion rescue gear and techniques. Tom will also lead a hands-on lesson on how to properly and efficiently use your avalanche transceiver. Bring your own avalanche gear to practice with, demo some of the newest Ortovox models or just come with an appetite to learn, and you won’t be disappointed. 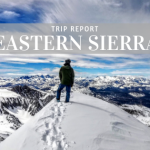 When: December 17 | Doors 5:30 | Official Program 6:15 p.m. to 8:00 p.m.
Raffle: Participants can enter the series-long raffle (supporting the Sierra Avalanche Center) to be drawn on Feb. 5, 2014. In the second of the three-part Avalanche Education Series, Black Diamond representatives will be on-site to lead a technical discussion about avalanche airbag backpacks, how they work, survival rates and statistics, personal accounts and learning experiences from the field. Participants will get to activate their airbag packs during the event, which will add even more fun to the evening. Since all Avalanche Airbag Backpacks should be serviced annually, this is an opportunity for you to receive a free servicing and full exchange canister for your ABS, The North Face, Mammut, BCA or Ortovox airbag pack. If you are interested in purchasing, this will be your best chance to save some dough on a brand new Avalanche Airbag Backpack. Stay tuned for more details about the Airbag Educational Evening. When: February 4| Doors 5:30 | Official Program 6:15 p.m. to 8:00 p.m.
Raffle(s): This will be the biggest raffle opportunity of the season with the grand prize being a Mammut Protection Airbag Pack. In addition to the grand prize from Mammut, gear from brands like Smith, Oakley, Pieps, Arva, Marmot, Twenty Two Designs, The North Face, Arc Teryx and more will ensure everybody walks away with something. Come out to learn and support the Sierra Avalanche Center for this great event. In the third (and final) event in the three-part Avalanche Education Series, Don Triplat and representatives from the Sierra Avalanche Center, a Lake Tahoe Region non-profit dedicated to providing a free daily avalanche advisory for the central Sierra Nevada, will lead an extremely useful presentation about how to properly read and interpret the avalanche report. Emphasizing the “Know Before You Go” mantra, participants will have the opportunity to discuss technical and situational issues that arise in the field to create a good platform for safe decision making in the backcountry. Previous PostFinding Winter - Mountain Hardwear Next Post Join The North Face Athlete Conrad Anker at Truckee Opening Party!